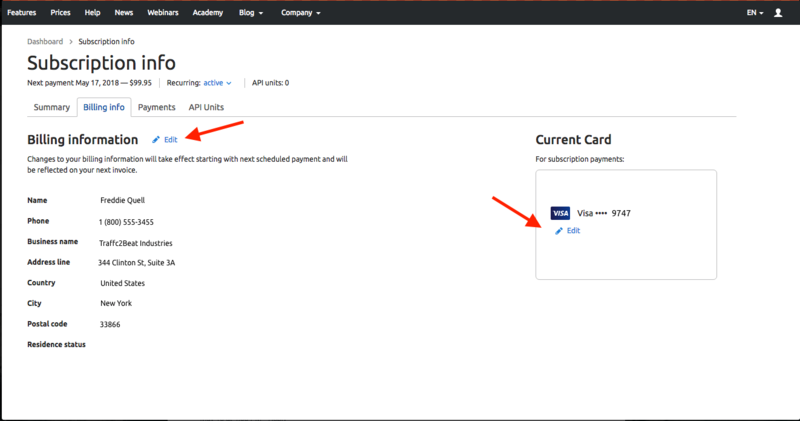 You can update your payment information (credit card and billing information) from the Billing Info section in the Profile menu. There are links to edit your billing information such as name and address, and your current credit card associated with your subscription. If you cannot edit your billing information from this page (due to an expired credit card), you will need to re-subscribe from our Prices page with an updated card and billing information. As long as you re-subscribe within 30 days, all of your Projects data will be saved on your account. Please note: At the moment, PayPal is not available as a Payment option for European citizens. If you are outside of Europe and are looking to change your account payment method to Paypal (or from Paypal to a credit card) please contact SEMrush support at [email protected] and a support team member will be more than happy to help.